Christmas in Europe is really something special. There is a general sense of excitement and joy as people welcome this season. German culture holds many traditions and festivities close to heart, without which it would simply not be Christmas. Both the Advent wreath and the traditional Christmas Markets are non-negotiable here in Germany. The Christmas markets especially are not to be missed. 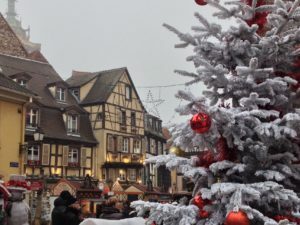 Spending a holiday season in Germany is an experience that is truly magical! In German, Christmas is called “Weihnachten.” People also refer to this season as Advenszeit, or Advent time. A beloved tradition that people have here is the Advent wreath. Every family will either buy or make their wreath, which is made of branches and greenery wrapped in a circle and put it in a prominent place in their home. Each of the four Sundays of Advent families gather around their wreath to light one of the four traditional red candles, lighting an additional candle each week until the final Sunday, when all 4 candles are lit. This tradition prepares families’ hearts as they count down to Christmas Day. It reminds children and adults alike of the Light of the World who came that first Christmas to bring peace to Earth. This is a tradition that even non-Germans have adopted to get into the Christmas Spirit. The most enchanting thing about this time of year in Germany is, hands-down, the world famous Christmas Markets. People from all over the globe travel this way to experience the excitement of these markets. 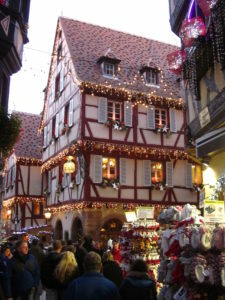 They are known here as “Weihnachtsmärkte” or “Christkindlemarkt” which literally translated means “Market of the Christ-Child.” These are not only a tradition in Germany, but all over Europe in places like France, Switzerland, Hungary etc. Regardless of which country, almost every major city and many towns and villages welcome the markets as November draws to a close. Shuttered stalls will pop up in squares and streets in late November or early December. When the markets finally open to shoppers, it is like stepping into a hallmark Christmas card. Clusters of stalls carpet the town squares in front of 500-year-old Cathedrals. Streets shut down to accommodate rows upon rows of little wooden booths. Everywhere you turn there are shiny decorations and greenery. Ornaments of every size and color dangle from triangular rooftops and shutters. And then there are the lights! You’ll see strings of lights and twinkling lights. From all directions there are lights that shine out of paper stars or glass candle-holders. It really is a sight to behold at night. There is nothing quite so lovely as lights glowing everywhere, warding off the darkness. It is especially lovely to walk through the walkways as the sun is setting and to linger in the inviting glow of a particular stall. Booth owners arrange their displays in eye-catching layers to draw passerby’s. Each counter offers various goods and products. Here you can find just about anything for sale: teas, soaps, nativity sets, ceramic pottery, kitted hats, wooden ornaments, kids toys, local cheeses, leather goods … Some things are “made in China” while other items are hand-made two villages away. Some folks come to these markets to find presents for friends and family. Others come to see if something catches their eye, perhaps looking for new holiday decorations or a favorite potter’s dish to add to their collection. There is surely something for everyone and every taste and style. All together the booths offer goods in every color imaginable. Not only is it a feast for the eyes, but also for the nose! Many of the stalls sell food and beverages. Here you will find traditional Bratwurst on buns, warm pumpkin soup, and potato fritters with apple sauce. My personal favorite is the smell of fresh-baked waffles with cinnamon sugar. The smells drift through the air and entice shoppers to stop for a bite. It is a must to sample the local fare of the markets. The drinks on offer are also tradition. Hot “Glühwein” or mulled-wine is sold in small glass mugs, which can be kept as a souvenir. There is also hot chocolate and punch to satisfy a sweeter pallet. But don’t be surprised: the lines for the food stalls are often the longest of any of the booths! It is well worth the wait, though, to experience typical Christmas Market snacks. With food and drink in hand, you can huddle around tall make-shift tables available near the food booths and chat with others folks. This is also the best time to people watch. As you savor your lunch, you can see parents chasing after children, couples holding hands as they navigate the crowds, and tourists craning their necks to take it all in. People of all ages come to the markets re-awaken their inner child.